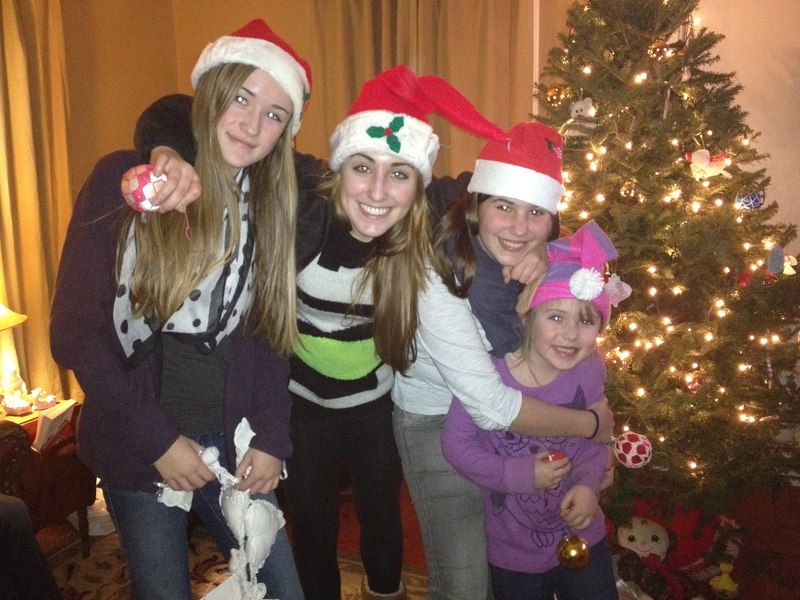 Flash from the past: This is a picture from last December of my three oldest girls and one Spanish exchange student. It was a great semester! I know it’s summer, and this is a Christmas photo; but if your summer is humid and hot like it is in Vermont, you might be dreaming of December and icy cool snow too! I honestly would love to ski right now. Anyway, children change your life. They keep it real. From the time they’re born with their delicate cries that keep you awake late into the night, through the years with illnesses, school, friends, activities, happy times, frustrating times, and all sorts of various events. They keep life evolving. When my kids were little do I dare say times were almost radically different than they are now. I home schooled the oldest four for ten years. We lived with a yard overflowing with berries, woods, and wild life. It was a wonderful experience, a slice of heaven. Now they’re all in school and headed in different directions. We live in a public area with a tiny yard. Although I am happy to say that we do have a few berries, a cool tree to climb, and an adorable bunny who hops in and out once in a while. But I am now living through the “new” life of teens, with dating and driving, along with the familiar road of tiny tigers. It basically means that because of these beautiful souls I am perpetually sleep-deprived; my time is rarely my own. I hear all kinds of things. My oldest daughter tells me that kids are brutally honest with their feelings. Wow is that the truth. So, yes, children have shaped our lives, made us humble. Every once in a while my husband nods his head and says, “We’re going to get through this.” He says that because our lives are enriched, but it doesn’t go without a struggle sometimes. Keeping life real is about respect. I love and care about my own kids and those who come into my home. With exchange students from varying countries, we are learning to respect different beliefs and cultures. I hope that experiencing such a busy household will change their lives for the better. I know it’s changing mine. I like to think that helping each other is a two-way street that benefits all of us, and leaves us with something we can share with the world. So hey…why not rejoice in today’s youth? Kids make a difference. They’re our future. They certainly do keep life real! This entry was posted in Uncategorized and tagged difference, inspiration, kids, life, love, parenting, world, young. Bookmark the permalink.